A60A95-195-3000 is a Reverse Polarity (RP) SMA Male to Reverse Polarity (RP) SMA Female Bulkhead cable using our LMR195 equivalent CLF195 coaxial cable. RP SMA 50 Ohm connectors are used at both ends. 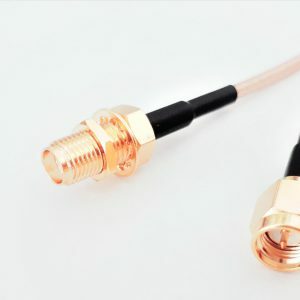 SMA to SMA cables have many uses, but primarily they are used to connect external antennas to mobile devices such as phone cradles or network adapters. They can also be used for extending the length of existing cables for that little bit extra physical reach! SMA are similar to FME connectors so to be sure to check with us if you are unsure before ordering. SMA is generally preferred over FME as the connectors are rated to work at higher frequencies exceeding 3GHz. Our Low loss range cables are recommended for use in cables over 1 m.
This assembly uses one of our most popular cables. Our CLF195 cable outperforms many of our competitors LMR195 equivalents! With lower loss over frequency and our great build quality you can be assured of a great performing cable! Being a more flexible cable CLF195 can be used where space is at a premium or where you may need to bend the cable around other objects. With its great ease of assembly CLF195 allows us to consistently make you a top quality final product. Reverse Polarity Male connectors have a male body(nut) with a female pin. Reverse polarity Female connectors have a female body (outer thread) with a male pin. Most often RP connectors are used for Wi-Fi applications. 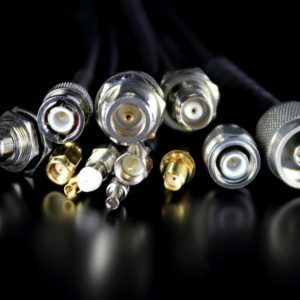 Male to Male cables are often used for connecting external antennas to base stations. Male to Female cables or flyleads are more frequently used as extension cables to extend the length of existing links. 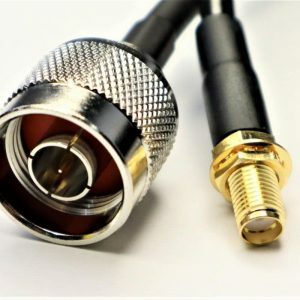 All assemblies are also available as pigtails with one connector only.